I am totally spoiled and obsessed by the American housewives of DC, OC, NY and Atlanta. The dynamics between the wives, their vulgar fabulousness and ability to create drama out of thin air combined with a drive to shamelessly monetize their fame is really a vitamin pill to watch. Hilarious is also those of them who claim to have class, wow, class in America is certainly not the same as in Europe, but American classy certainly is more entertaining than the European, muted, understated way of showing class. TV 3 had a huge success with first season of Swedish Housewives of Hollywood, with the obnoxious and fake Anna Anka who certainly is not very Swedish in her tacky, wacky way. Maria Montezami, a typical Swedish housewife from the “whining belt” in Sweden, known for a dialect that sounds very – whining and a little bit stupid, is as loved by the Swedes as Anna Anka is hated. This season when three new Swedish Hollywood wives where introduced I lost interest in the series, to boring. And TV 3 just doesn’t get it, no one wants to see stiff, Swedish women show off their houses, cars, dogs and how they go shopping in ordinary boutiques or have boring dinner parties at home. We want to see interaction and drama in the dynamics between the wives, the back stabbing, the rivalry, the screaming, the hair pulling, the cat fights, that’s what we like to see from the rich and fake fabs that volunteer to such shows. The Swedish wives are so careful to show off a façade that they think will impress their sisters back in Sweden that they become pathetic and boring. Thomas Nordengren, Elin Nordengren's father, a reporter at Swedish Public Radio, is critical on how Swedish media reported on Tiger's and Elin's divorce. In an interview with the Swedish magazine Resume he claims that the tabloids Aftonbladet and Expressen is publishing information from the gossip sites without fact checking. Thomas Nordengren has been under a very high pressure from domestic and well as international media, he has not wanted to comment on the case though. The other day though, he told AP that "We love Elin, and we are so proud over the decency and strenght she has shown during these difficult times. We know that she will get through all this as an even stronger person, and that she has a bright future. Today the divorce between Elin Nordegren and Tiger Woods was finalized here in Florida. Elin did her best to protect her and her childrens safety and integrity by divorcing a husband who was an obvious liability. I wish Elin and her children the best of luck and I am sure these kids will do good in the hands of Elin. The new series Norska Hollywoodfruar (Norwegian Hollywood Wives) show the lives of some Norwegian trophy wives in Hollywood. Among them is Siv Cotton. In her introduction we're told that she - among other things - has earned a BA in the US. Then they show the diploma... it's from the University of Phoenix. The University of Phoenix has widespread reputation for being a diploma mill. A place where you can earn your degree with very little academic achievement and skills. If I were Siv Cotton, I would never have shown that diploma. As a matter of fact... I would not even put that on a CV or mention it to anyone. It's nothing to be proud of. It would have been interesting to see how Siv would fair at a real University. Paivi Hacker, 51 years old, born in Finland, moved to Sweden as a 9-year-old and to the USA at the age of 24. Paivi is married to an American businessman, and it is obvious that she has spent more than half of her life in the US, she is not so Swedish anymore, she speaks with a Finnish-Swedish accent and her general appearance is as blank as her botoxed forehead. Paivi is a wife, but she is not Swedish. Swedish housewifes in the USA, look at this! Do you want to be the next star of Sweden’s new reality show? One of the world’s leading production companies, Eyeworks (The Biggest Loser, Beauty and the Geek, Bingolotto) is NOW CASTING three young and beautiful Swedish women who are all married to super successful American men. We are looking for outgoing women with strong personalities who have found love in America. 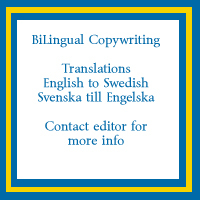 We want to invite our Swedish viewers to your exciting life that differs from their normal Swedish living. We are particularly keen to find couples with a “May/September” love story so if you are a beautiful Swedish woman married to a wealthy or powerful older man you could be the star of our show! We want to hear your story! Please contact us with your contact details and some very brief information about you and your husband. The filming will take place in the US and there will be substantial payment for our stars! Anna Anka, a role model for Swedish women? One of the most talked about Swedes in Florida these days, Elin Nordegren's Tiger has turned into a cheetah and Anna Aberg's duck has left the pond.The Swedish blondes in distress have a few things in common, they allegedly attacked their husbands, Anna by hurling an ice cube and Elin by swinging a golf club. They married celebs and they have children with their famous husbands. Their hubbies are good for millions of dollars and in case of a divorce they will probably walk away with some millions on their bank accounts. Elin Woods is a Swedish woman with good education, a strong and successful family and very good friends that could not care less about the money her husband has made. She has nothing to lose by leaving Tiger Woods and the friends and mistresses he bought. Obviously the so called friends of Tiger Woods who acted as pimps by sending willing mistresses all over the world do not care for him they care for his money and so did the mistresses. I mean with friends that helps you to destroy your family, you certainly do not need enemies. The Swedish broadcast network, TV 3, has now aired three episodes of the record breaking series, Swedish Hollywood Wives. Not only did the series have a viewer record for the first episodes, one of the reality stars, Anna Anka, has caused a national gender equality debate, she has also become so popular that she was jetted over from the US to participate in a Swedish talk show, Skavlan, she also mingled with Swedish B and C celebs at some parties. The three episodes of the Hollywood Wives can be viewed online from www.tv3.se. The Swedish Hollywood wives do not have much of a fab or glam factor and very little drama compared to the US series The Real Housewives of that without doubt served as an inspiration for the Swedish, low budget and most of the time boring copy. Very Swedish, very lagom (just enough). A new docudrama a la The Real House Wives premiered on Swedish television. The house wives participating in the Swedish soap called Swedish Hollywood Wives are Swedish women who have married rich and successful men in Hollywood, USA. The first episode of the series had more than 600 000 viewers, making it the most watched television program at the 9.00 pm time slot. One of the house wives is Anna Anka, made and born in Poland, adopted to Sweden as a three-year-old married since 2008 to Paul Anka, born Paul Mustapha Abdi Anka by Lebanese immigrants in Canada.